Today, in Brussels President Serzh Sargsyan met with a group of members of the European Parliament. The President of Armenia congratulated them on the occasion of the meeting and handed high state awards which the parliamentarians were bestowed last year. 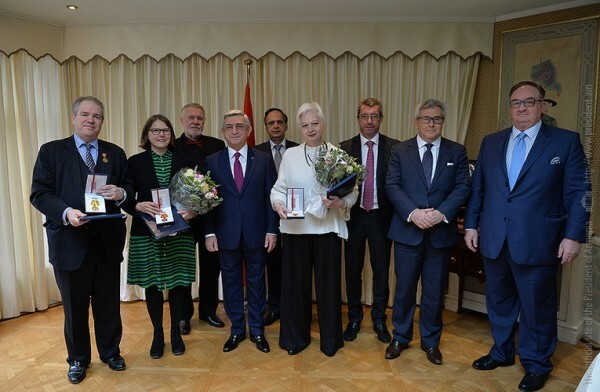 In particular, for the considerable contribution to the expansion of the parliamentary cooperation between the Republic of Armenia and the European Union the Vice President of the European Parliament, Vice President of Euronest Parliamentary Assembly Ryszard Czarnecki was awarded the Mkhitar Gosh Medal. Members of the EP committee on Foreign Affairs and members of delegations at the Euronest Parliamentary Assembly Jacek Emil Saryusz-Wolski, Knut Fleckenstein, member of the EP, the Head of the Friends of Artsakh Group at the European Parliament Frank Engel, member of the EC committee on Foreign Affairs, member of the Armenia-EU parliamentary cooperation committee, member of the delegation at the Euronest PA Jaromír Štětina for his contribution to the international recognition of the Armenian Genocide, member of the Armenia-EU parliamentary cooperation committee, Co-Chair of the Euronest PA Heidi Hautala for her contribution to the strengthening of the RA and EU parliamentary cooperation and international recognition of the Armenian Genocide were also bestowed this award. The Mkhitar Gosh Medal was also awarded to the Chairperson of the EU-Armenia Friendship Group at the European Parliament Eleni Theocharous who was bestowed the award for the development of the friendly relations between Armenia and Cyprus and for the considerable contribution to the expansion of parliamentary cooperation between the Republic of Armenia and the European Union. The member of the EC committee on Foreign Affairs Charles Tannock received the Medal of Gratitude for his considerable contribution to the international recognition of the Armenian Genocide.